Mochi rice pounding. One of the important New Year traditions in Hawaii. Photo courtesy of Walter Inouye. New Years in Hawaii certainly captures much of the same traditions that you will find most anywhere in the US. But the Hawaiian Islands have different, but appealing aspects of this season that visitors are sure to appreciate. So here are some of the unique New Year traditions in Hawaii. For starters, many people in Hawaii say Hau’oli Makahiki Hou as a way to bid Happy New Year in Hawaii. One factor that makes celebrating the New Year in Hawaii so unique compared to the rest of America is its cosmopolitan make up. Here are some examples of how Hawaii’s many ethnic groups have contributed to how the Aloha State now celebrates the New Year. 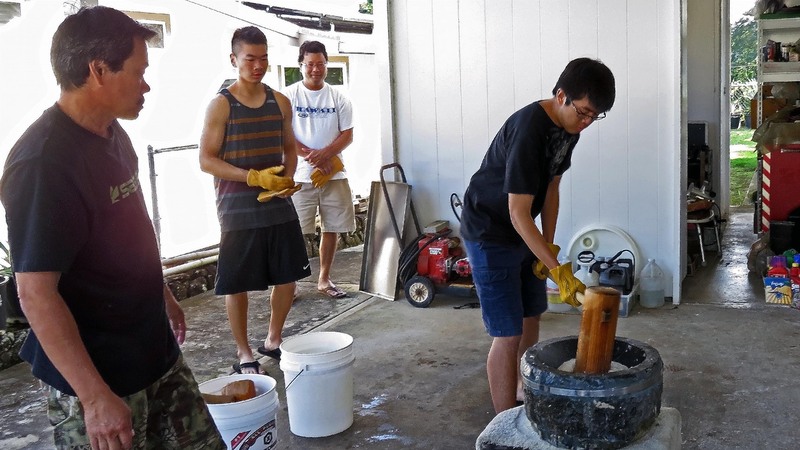 One of the traditions of Japanese culture in Hawaii is the making of mochi, or rice cake, the old fashioned way. This is done by pounding steamed glutinous rice by hand. Following Japanese traditions, one pounds the rice with in usu, a wooden or stone mortar, with a wooden hammer. Two people are needed for this operation. One person pounds the rice. While the other turns it. Timing is important here, especially for the person turning the rice. Because if it isn’t right, one can pound someone’s hand with the hammer. After one pounds the mochi into a soft batter-like substance, it is hand molded into mounded patties. The patties are symbols of good luck for the New Year. People will use them in a decoration that the Japanese call kagami mochi. Many also eat mochi fried and dipped in a sauce of soy sauce and sugar. You can also eat them as dumplings in ozoni, a clear broth soup with special seasonal vegetables. The eating of ozoni soup is customary during this time of year. 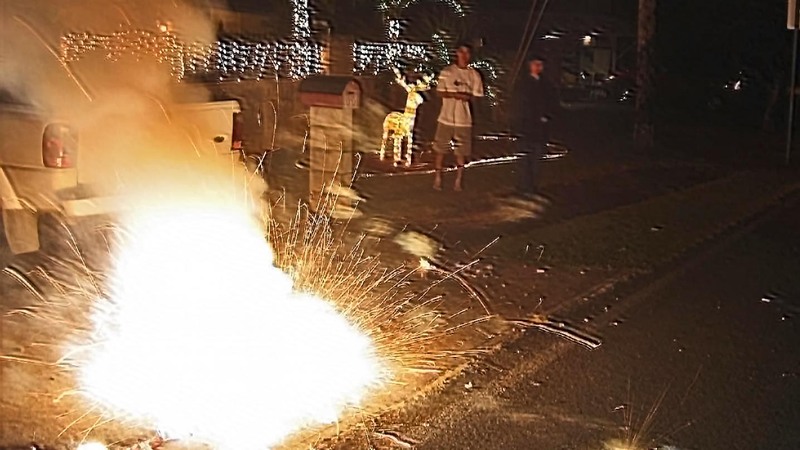 Exploding fireworks on New Year’s Eve in Hawaii. Hawaii’s residents have embraced the Chinese tradition of exploding fireworks to usher in the New Year. In past years, fireworks of all sorts—rockets, firecrackers, cherry bombs, flares, legal and otherwise—once massively proliferated Hawaii’s neighborhoods. Hawaii loved fireworks so much. they created smoke and fire damage throughout the islands. As a result, they became a health and safety hazard. So today, one can only a legally set off a limited amount of fireworks on private property. In addition to fireworks, an integral part of Hawaii’s Chinese tradition for the New Year is the preparation and eating of jook. This is a rice porridge typically flavored with bits of cooked chicken and salted or preserved duck eggs, garnished with pickled vegetables. Residents typically eat this dish after the clock strikes midnight on the first of January of each year. Eating sashimi, or Japanese for sliced raw fish, most typically tuna or ahi, is one of the key food dishes that locals must have during the New Year. Demand is so great during this time, the price of ahi skyrockets during this time. So you can expect to pay up to $40 a pound for premium grade ahi. Depending upon supply, even medium grade ahi can go for $25 to $30 a pound. People typically serve sashimi on a bed of shredded lettuce or cabbage with a dipping sauce comprised of soy sauce and wasabi (horse radish).